Hi TIGSource! This is the official devlog for Blink the Bulb, a platform game I've been working on for some time. I thought documenting its progress and getting feedback from others might help it along. Everything was once peaceful in the Jubilee Realm - a distant universe formed from individuals' fond memories of the holidays. Here, humanity's composite recollections were weaved into brilliant landscapes and simple, kindly beings. However, ages have passed and the thoughts that shaped the realm have been tainted by a dark force - people's spiteful memories of their special occasions. The Holidaemon, six ruthless beings born from this negative energy, have begun taking over the Jubilee Realm and threaten to infect all its inhabitants with their influence. Thankfully, all is not lost. Blink the Bulb, a lone resident of Winter Land, has set off to defeat the Holidaemon before they conquer his entire world. Looking skyward, he vows to vanquish their evil and restore the inhabitants of the Jubilee Realm to their former selves. In every stage, you'll find lots of chests that can be unlocked either with a sum of collectible sparks or instantly with keys. They contain various items, though the ones you'll likely be making the most use of are different heads based on various sources of light. Each equipped head will give Blink a new basic attack, a new double jump, and a special ability. Here's a preview of two I've got in the game so far: a star light and a lamppost. Other than heads, you'll find consumable items that do things like restore health and grant invincibility. Lastly, you can find passive items which aren't directly usable but have percentage-based chances of causing beneficial effects. Passive items are stackable, meaning you can collect a bunch of a certain type to maximize your chances of its effect occurring. In all, you'll be able to hold 8 heads/consumable items at once and 16 passive items at once. All the graphics, sound, music, and code is being done by yours truly. Current plans are for the game to be done Summer 2015 and available on PC, Mac, and Linux. Lastly, here's some assorted content from the game for your viewing/listening pleasure. A snapshot of Love Land, the Valentine's Day-themed world. I should have some .gifs and/or gameplay videos soon to better demonstrate the gameplay. I'm also aiming for a playable demo release sometime in December. Wish me luck. and, you know, the story is really rayman-esque. the music is the least interesting thing you've shown here, but that shouldn't be taken as a huge criticism; it's not bad! assuming you're using fl studio, because this...sounds like it was made in fl studio. it's happy and jaunty even if it's compositionally all over the place. i'd recc listening to a lot of classic sonic tunes and grabbing how their structure works to get more of a sense of melody/form down. even if you don't bother with that, though, this looks like it will turn out well. reminds me kind of lyle in cube sector, actually, even though i don't know why! how long have you been working on this for, out of curiosity? i do wish blink had a little more width to him; his hyper-thinness feels wrong, somehow, to me, but this could just be me! maybe in motion it works out better. i feel like if he had a slightly bigger/wider head (note how he has what appears to be hair in the love land pic because of the background; that actually feels a lot more satisfying, weirdly!) it'd be awesome. Thanks for the feedback/compliments! A little off topic, but I checked out your game and it looks really interesting. I'm looking forward to playing it when it comes out. I especially appreciate the criticism of the music. I expect to rework that particular tune in the future, since it and the game's soundtrack as a whole has been redone a lot. I'll check out some old Sonic tunes like you said for inspiration. And yes, it's done in FL Studio. I'm still a bit inexperienced with the software and hope to improve. To answer your other question, I think this game has been a project of mine on and off for 2-3 years. It wasn't until this year that I've started working on it more constantly. I've probably made more progress on it since February 2014 than I did in the years prior. If you wanted to see Blink in motion, I went ahead and recorded a short gameplay video of the first level of Winter Land during the day. Hopefully there's some more stuff it shows off to comment on as well. That's it for now. I'll have some more updates soon! I recommend you keep a current gameplay video link displayed prominently in the topic post. The link you have represents your game well, but it is too easy to miss down in a response post. The gameplay video doesn't feature any sound. If you can do a video with sound, please post it. I know you know important sound is to the experience. The first thing I thought of when I saw the video was speed runs. They're fun to watch and add a lot of replay value for some players. For starters, all you would have to do is display a timer and show it off at the end. The game's flow seems pretty well suited for this. Thanks for the advice, Bob! I went ahead and made a new section for gameplay videos in the title post. Though I disabled the audio for that gameplay video, I can put it in future ones. Everything is still a work in progress in that department, so I wasn't sure if it should feature music at this point. I do want to continue to post tunes from the game and get feedback on them though. I really appreciate the speedrun suggestion and think that'd be a great addition. Here's a tune for this world I've been tinkering with as well. Still making progress on Terra Land. 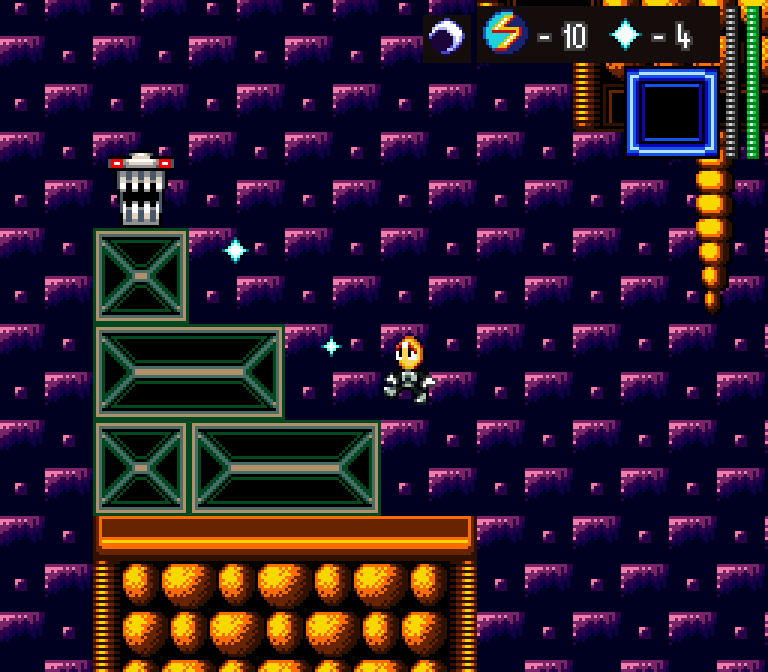 I prettified the tiles a bit and should have the world's level layouts done by the end of the week. Here's a preview of the miniboss for Winter Land... well, at least the one you'll fight during the night. The time of day will determine what kind miniboss you'll face for each world or their attack patterns. Here's a preview of one of Love Land's main gimmicks that I've been working on. These colorful tubes can take you to different parts of the level, but may be closed off during the nighttime. Is that boss the lamp from a Christmas Story O_o? It's probably your own design or something, but look up that reference if you don't know what I mean, heh. Nice job catching the reference. Yep, it's intentional. I've been polishing up the game for the past week or so. Today I plan to make sure the passive objects are properly working/stacking and add some additional head powerups for the Valentine's themed world: a firework head and a moodlight/heart-shaped head. I plan to have a playable demo posted before Christmas that should include two fully playable levels with night/day variations. If I hustle, I can get some random level effects in the demo as well. Here's a screenie of the menu that you can access to equip new powerups, view your items, throw away items, etc. What!? You can willingly give up your possessions? Are you sure this game is fit for todays society? Here's hoping people will find the that whole 'selflessness' thing charmingly retro. Sorry I've been away from my devlog, fellow TIG-ers. I was sick for a bit of my Christmas break and didn't meet the pre-Christmas demo deadline I had hoped for. However, I'm feeling much better now and trying to get something playable done by Wednesday at earliest... early January otherwise. In the meantime, here's a few exciting screenshots of the stuff I worked on today, including: polishing/preparing the boss encounters, developing/testing out some of Blink's abilities, and sprucing up the graphics. Enjoy! The mid-boss for Winter Land's first area differs depending on the time of day. This guy can't hold a candle to Blink, seeing how he is one. Someone mentioned Ristar but this also looks like the old Zool games to me. I want to see more of that stiletto lamp-shade enemy. I agree about the Zool look. It also reminds me of James Pond for some reason. Seeing something Zool-ish is great, though. Any retro game that reminds me more of DOS than the NES is refreshing. Thanks for the comments, guys! I grew up with a Sega Genesis, so the art style is probably influenced by that. Without further ado, I've got a demo of the game ready. It's still unpolished in a lot of ways, but perfectly playable in this state. A lot of the art assets are works in progress, so I expect them to change as the game develops. The title screen and stage select screens are going to get overhauls as well. Enjoy! Comments and questions are welcome! This was quite fun to play. - The enemies turning cute after being defeated was a nice touch. - At one point in the first stage the music suddenly stopped, and didn't come back. - What's the green bar in the corner? At first I thought that was my health. - I found the jumping a little hard to get used to. I kept feeling like I was flying forward either too much, or too fast. I did get used to it by the end of the second level though. The stage music was last minute addition, so I think there are still some issues with it fading in and out at inappropriate times. It should be fairly easy to fix though. The green bar is going to be used for a specific ability that each head powerup gives you. Right now, the different heads just change your appearance and weapon behavior, but I would like them each to also alter your double jump and give you a specific ability. For example, the starlight might let you dash left and right, the moodlight might let you float, etc. The green bar will deplete as you use abilities to prevent you from spamming them, but will gradually refill over time. For the double jumping, I could adjust the player's acceleration/deceleration if people think it's too slippery. Was getting used to it an exercise in frustration for you, or just something that happened naturally while playing? Oh, I see. I feel like the health should maybe be a bar too. It wasn't annoying enough to make me want to quit playing (I enjoyed the aesthetic too much), but it was pretty frustrating at first. I almost wanted a ground pound move, like in Yoshi's Island, to allow myself to fall directly down wherever I wanted. Maybe that could be one of the special head abilities? I'll see what I can do about that. Some of the passive items you get give you added defense against the game's four damage types: fire, light/energy, physical, and spike. When you take a hit, your HP can drop to a fractional value (from 10 to 9.2, for example.) Still, I think I could represent that with another bar fairly easily. I definitely have a ground pound move planned for one of the heads, so you're in luck. Hopefully that will make double jumping easier. Still working on the enemies and obstacles for Terra land. Also, here's a preview of the music for The Halloween-themed stage: Fright Land.